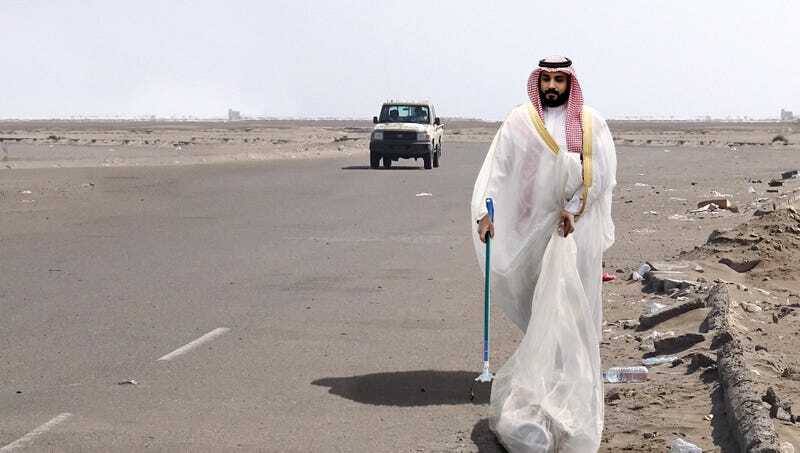 RIYADH, SAUDI ARABIA—Working with cleaning crews alongside the Riyadh-Dammam Highway, Saudi Crown Prince Mohammad bin Salman began serving his 100 hours of court-ordered community service Thursday for murdering journalist Jamal Khashoggi. “Well, I’ll admit it—I got mixed up with the wrong people and I did some bad stuff, so this is what I get,” said the crown prince, who had reportedly been picking up trash since 5 a.m. that morning after a Saudi prosecutor found him guilty of ordering the assassination of Khashoggi. “Is 100 hours of work in the sweltering heat a lot of time? Yes. Is it perhaps too much? Of course! But in Saudi Arabia, we have to show our citizens that no one should be able to get away with murdering members of the media. Not even me.” At press time, the crown prince had reportedly left the premises after convincing his parole officer to let him serve the rest of his time stoning women and beheading prisoners.